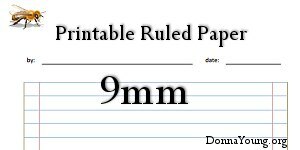 The printable filler paper on this page feature a rule height of approximately 9mm. The rule is blue with pink margin lines and the outside margin line is olive. The names of the files are rather vague, but they are listed alphabetically and, for my purposes, the names are kept short. If any of the images could be called a theme, then most of them are listed together, however; not all of the themes are listed together. Days of the week - The files are named after the days of the week. Planets - The files are named after the planets, plus Pluto. Non-Subscribers - File linkes with a gray background require a subscription to YoungMinds. Subscribers, if you see this message, please login. The 3 files linked at the top are plain and in the case of these files, that means the file has no image and the words "by" and "date" are omitted as well as the line. All of the images used in the files on this page are from Microsoft's online clip art collection. The clip art collection can be accessed from the Microsoft product, in this case, from Word, via the insert menu. To make the image display on either the right or left hand side of the file, first select the image if it is not already selected. Right-click the selected image and from the menu choose Text wrapping, then select Tight.